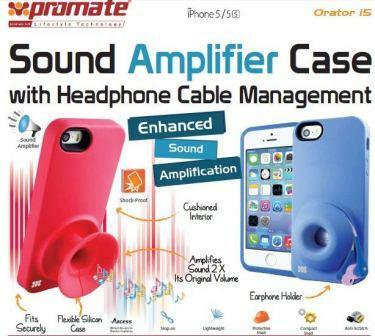 Promate Orator.i5-Sound Amplifier case with headphone cable management-Live out loud with Orator.i5. This case redirects the sound from your speaker for an increased sound projection, making its presence known loud and clear without any wires or cables. The tough yet flexible Silicon shell provides a secure fit to your iPhone 5/5s. 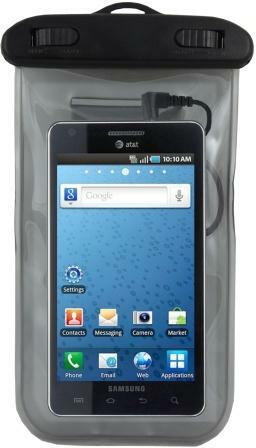 A cushioned interior layer provides soft, impact-absorbing protection and is detailed with a cool textured pattern. A unique, contoured profile offers an enhanced grip and allows the case to stand upright on its own and unique headphone cable management system lets you store your cable more securely. Orator.i5 is perfect for showing off your music with maximum device protection. 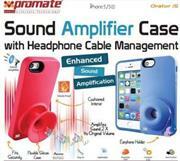 Promate Orator.i5-Sound Amplifier case with headphone cable management.